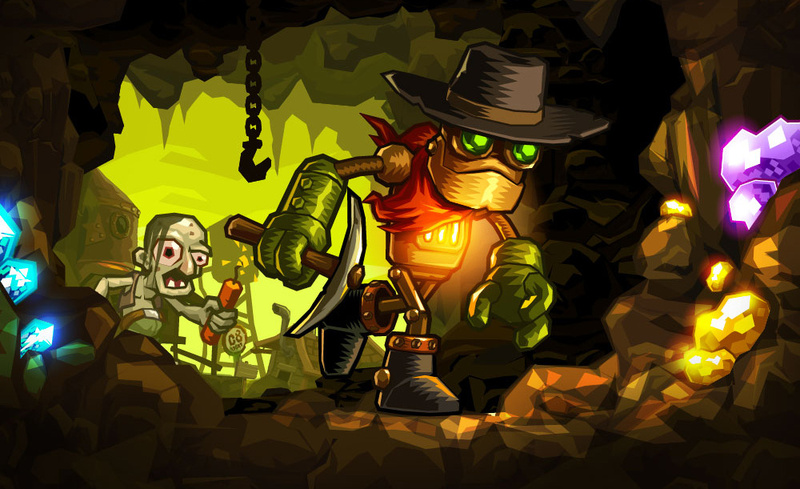 Are You Fast Enough to Enter the SteamWorld Dig Perfect Run Contest? In the months following the release of the excellent SteamWorld Dig on the 3DS eShop, our friends at Image & Form have had varying reports from fans about how quickly were able to complete the game. Some of these were so impressive that they have even caused CEO Brjann Sigurgeirsson to question his own skill at playing the game. To establish once and for all who is master digger, Image & Form have unveiled details for the SteamWorld Dig Perfect Run Contest. The requirements for all four gold stars (the "perfect run") are as follows: 20000 gold, 150 orbs, zero deaths — in less than 2 hours and 30 minutes. The best time wins the grand prize, which is to become the first person in the world other than Image & Form staff to play the next SteamWorld game — the winner will get their copy before anyone else (including even Nintendo Life!) — plus they will be immortalized in the credits section of that game. The winner and four runner-ups will also get snazzy t-shirts. The contest closes on 20th November, so you had better start practising now. To enter the contest simply take a photo of the end screen and email it to [email protected]. That does sound pretty cool! It took me something like 5 and a half hours to beat the game, ended up having 4 deaths though. That was only my first run, I definitely look forward to playing the game again. Doing a perfect run like this though would probably take wandering through the dark a hell of a lot. Nope, I like to take my time, I wish that they release dlc for new worlds like the tundra, dessert, etc or let us create them. So when I finished it or so I thought it just went back to the title screen ? Have I not finished it ? Or did I skip the relevant part ? I still haven't beaten this game. I hate speed runs, especially in games such as this one, full of opportunities for thorough exploration. So I'm gonna pass. But on another note, next SteamWorld game? Oh, do tell me more! My best run was earning a gold star on money, orbs, deaths (0 deaths), but finishing in 2:42...so I got the silver for time. Now that I know the exact amount needed to hit the first three, maybe I could get under 2:30. I wasn't trying to do it quickly (Just trying to make sure I didn't miss any orbs / ore). I didn't really want it to end. All that I got was the title screen again but it grey. (After a cutscene). After the only real boss in the game. i beat the game in a couple hours during my first playthrough, and even less during my second. game was pretty short, but i'm okay with it because the game was made by an indie team, and the game is pretty fun for what it is. great game, but i'm never one to do speed-runs and perfect-runs, so the contest isn't for me. Great game you have here. I think it was the last game I actually looked forward to on the eShop. Any chance you will have the next SteamWorld game on a similar idea? Or possible DLC? While I shy away from DLC usually, I could see you being able to implement DLC in different fashions like new types of mines with new enemies or having new mines with bosses at the end. Only other thing I could say is if you went and combined them, you would be able to make mines about the length of one of the current three, could lock the abilities from the main game and unlock them through the skill mines, and the numbered mines would unlock specific abilities needed like the Drill or Steam Punch to be able to progress. Then there could be some kind of boss at the end to see if we can overcome that challenge. Unfortunately, I cannot think of any lasting reward to put toward the main game for completing this. DLC usually has some impact on the main game. Maybe this idea would be better added to a sequel? Anyway, I do not think I would be able to do this speedrun. Before this article, I thought the gold medal would be under 4 HOURS. Not less than 2 and a half. I have no CLUE how to shave 100 minutes off my time. Does anyone have a Speedrun of this available to watch somewhere on this internet thing? Damn, I missed the perfect run only on time, by about 15 minutes. Time to get training again. @LordGeovanni You should look up this guy Matt "Soup" Foley on the SteamWorld Dig page on Facebook (www.facebook.com/steamworlddig), he's the current leader - check with him if he'll share a tip or two! I doubt that we will create DLC for SteamWorld Dig, we have a hard time thinking up useful stuff. When we ever get around to making the SteamWorld Dig sequel, I'm sure we'll make it quite a bit longer. "Portable teleports certainly help ;D Also: delaying buying stuff until drill upgrades are available is a big boost, as well as not investing in the internal furnace upgrades or ladders/lanterns. I pretty much took my 36 minute run and tacked on an extra 40 minutes of collecting."